It wasn’t nearly as lopsided as the final score would seem to indicate. The Spaniards fought gallantly, and kept apace of the Americans with every basket and rebound, and the game went down the wire. 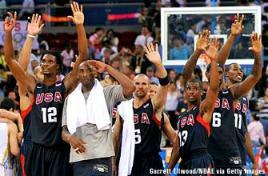 This wasn’t a replay of the earlier blowout suffered by Spain in the hands of the U.S. during the eliminations. The Americans reached the finals with a 7-0 card and won by an average of 30 points. This was supposed to be a walk in the park. It wasn’t. It was a two-point game early in the fourth quarter with a Pau Gasol dunk from an alley-oop and a Rudy Fernandez 3-pointer. The Gasol Brothers played like men possessed, and it looked as if the score would be close in the final minutes. It was. The U.S. lead was only six with 1:44 left. Spain was within striking distance. It was finally Kobe Bryant, Pau Gasol’s L.A. teammate, who put the game away with a drive and two free throws in the closing minute. The game was a classic. The Americans’ sloppy defense almost let the gold slip away. They were overconfident, and the Spanish strategy was to stay close throughout and finish strong. Coach K looked relieved at the final buzzer. Dwayne Wade topscored with 27, while Kobe added 20. Rising Spanish 17-year old superstar Ricky Rubio, who created the biggest basketball buzz at these Olympics, was hardly a factor. Is the Spanish basketball team racist ? The Guardian reports on its eye-catching faux pax.